Setting up a business for any product (as you should only need a duplicating charm to create as many product as you want) and much more. I believe there is no restriction of usage of Magic in front of Muggles for adult wizards as long as Muggles don't get too suspicious, and I don't think Muggles will start believing in a Wizarding world out of just a Magic show. Also Muggle Money can be changed into Wizarding Money at Gringotts or how else would Muggle Born have bought the Wizard things? "Oh look Molly, they are changing Muggle Money" said Arthur looking at nervous Hermione's parents who were standing just by the counter. Yes, there are restrictions on the usage of magic, quite clearly seen throughout the novels. There's the Misuse of Muggle Artefacts Office, set up to make sure Muggle-made items aren't enchanted or cursed. There's the Improper Use of Magic Office, which is well-known for enforcing the Trace, which tracks whether underage witches and wizards are using magic per the Decree for the Reasonable Restriction of Underage Sorcery. Part of their purpose is to ensure the magical community stays hidden from Muggles. In general, it seems that the policy is to keep Muggles from knowing about the Wizarding community, and also to protect them from being abused or taken advantage of by witches and wizards. It's reasonable to assume that wizards attempting to use their magic for gain or notoriety in the Muggle world would be dealt by the Wizarding Government (the Ministry of Magic in the UK). 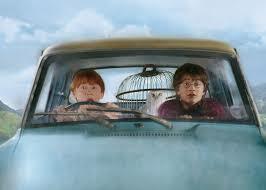 The Ministry of Magic even has a team of Obliviators who go around erasing the memories of Muggles that encountered magic, such as those harassed by Death Eaters during the Quidditch World Cup, or those that saw Harry and Ron flying Mr. Weasley's car to Hogwarts. The Wizarding majority wants to keep the Wizarding world secret from Muggles, and would self-police or actually police Wizards trying to work outside that system. Even the Ministry of Magic's relation with the Prime Minister of England is based on getting Muggle government support in helping keep the world a secret. Muggle government helped cover up the truth behind the attacks of Voldemort and his Death Eaters. We have no reason in the books to assume that Wizards be allowed to exploit Muggles without repercussion. Probably worth pointing out how entirely dismissive of anything Muggle-made the wizarding community is. Wizard-made clothing and accessories are a status symbol in addition to their various useful properties. Though I say it without much proof, I suspect parading around in Muggle-made copies of wizarding clothing would probably get one laughed at. Meanwhile, witches and wizards require very little support for basic sustenance. You can easily keep yourself fed, clothed, and sheltered with a basic magical education, so the pressure is fairly minimal. All that said, it's fairly possible that some witches and wizards do seek success outside the Wizarding World, just more subtly. Why else do we see so many half-bloods? The magical parent is almost certainly making it in the mundane world, and for adults, they'd be able to use magic so long as they do nothing to expose themselves or endanger the mundane world. "In 1790, the fifteenth President of MACUSA, Emily Rappaport, instituted a law designed to create total segregation of the wizarding and No-Maj communities." We're also told that "Scourers" exist, who know about magic and are taught to hate it by their families. So, In (the USA) America, it is neither safe nor legal for a wizard to earn money in the "no-maj"/muggle communtity. “Muggle women wear them, Archie, not the men, they wear these,' said the Ministry wizard, and he brandished the pinstriped trousers.
" There is legislation about what you can conjure and what you can't. Something that you conjure out of thin air will not last." How the Magic World obtains their food? Why couldn't Dudley testify at Harry's hearing? Do wizards pay income tax to the Ministry of Magic?